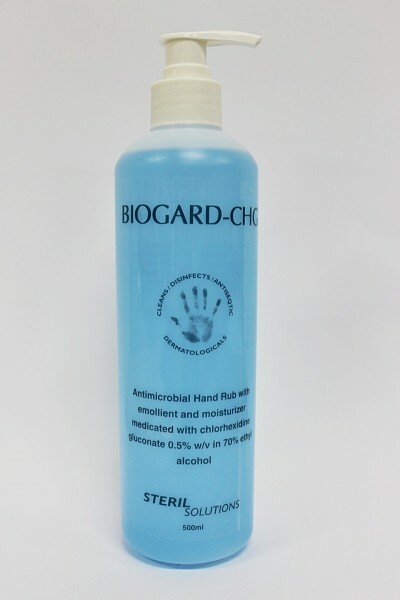 BIOGARD CHG HANDRUB is a broad spectrum waterless antimicrobial hand rub containing 0.5% Chlorhexidine gluconate and 70% ethyl alcohol. The solution is highly effective against resident and transient bacteria and a wide range of other micro- organisms. It combines the instant efficacy of ethyl alcohol and the persistent protection (4-6 hours) of Chlorhexidine gluconate against the resident microbes. Contains emollient that prevent skin irritation after continual use. BIOGARD CHG HANDRUB is supplied in a 500ml bottle and a dispenser that eliminates wastage by releasing 1 ml of solution with every pump and preventing subsequent spout drip. SKU: HUN 40 00 02. Category: STERIL Solutions.